With summer nearly over and the run up to the holidays about to begin, I wanted to take this opportunity to remind you all of the rousing and productive week at Microsoft Inspire this past July. We’re moving full steam ahead on our mission to help organizations maximize value, minimize risks, and achieve more with their IT investments through Software Asset Management programs. At Microsoft Inspire, my keynote session focused on the opportunity SAM engagements provide for businesses beyond just managing software inventory. I reiterated our commitment to customers to help increase value, lower cost, and make it easier to get things done with Microsoft. When organizations go through a digital transformation, they often experience a cultural shift. We’re seeing growing evidence of how SAM engagements have optimized operations and empowered employees for both Microsoft’s SAM partners and our mutual customers. The newly announced SAM Managed Service Program is designed to help customers drive better IT decisions throughout all software and related asset lifecycle management. In addition to many SAM benefits, this program also offers unique benefits to participating customers, such as value-based consulting on strategic IT imperatives (like cloud readiness and cybersecurity), a reduced risk of audit, flexibility and concessions for the best possible licensing optimization solutions, and more. Partners who are interested in learning how to become an Accredited Provider can find more here. Another important call out from my session was the announcement introducing our new platform: I-AM or “Intelligent Asset Manager”. We heard that our SAM partners have between 8 and 15 SAM engagements per year. We want to make it easier for partners to do business, so as a result, this platform is now replacing the SAM WorkSpace nomenclature as it simplifies business requirements, frees up partners’ capacity to do more, and increases ROI through the acceleration of digital transformation. While our amazing partner event inspired us to look forward and plan for success over the next fiscal year, it was also a time for reflection and celebration. So, it was with immense joy that I announced during my keynote address that the Worldwide SAM Partner of the Year 2017 is CIVICA. CIVICA is a global organization with 4,000 staff across 13 countries worldwide. Its mission is to bring together industry leading technologies, automation, people, and process to help deliver business results for its clients. The company and its leaders have really embraced what they call SAM 2.0, which is really focused on helping companies understand their IT assets more strategically. They see SAM data as a rich repository of information that can help organizations answer the tough questions they face today like, “How do I make my business more productive?” and “How do I take my business to the public cloud?”. Congratulations to CIVICA and to all our award winners and finalists. One of the many highlights from the week was a speech from Dr. Darryl A. Smith, Agency Software Manager at NASA, who talked about how investing time and energy in SAM best practices had saved his organization $100M. In a speech rich with detailed insight and background, Dr. Smith outlined the typical challenges organizations have when it comes to license management, including lack of an enterprise approach, limited visibility across the business, and inefficiencies in internal planning. For many organizations without a systematic SAM best practice framework in place, addressing the tip of the iceberg – capabilities, quantities, software price and/or maintenance – is all they are set up for, Dr. Smith told us. “Software vendors and tool providers may want to consider strategically partnering to deliver capabilities that provide greater value to customers that will assist with managing and securing their infrastructure, rather than being solely focused on finding ‘gaps’”, he said. Through its Enterprise License Management Team, NASA is now able to establish new enterprise software agreements, save money through best value procurements, and make more informed decisions thanks to centralized contract management, financial transparency, and thorough asset inventory. I speak for all our team and the audience that attended his session when I express my gratitude to Dr. Smith and NASA for sharing their insight and knowledge in what was an informative and actionable talk which you can watch now on demand below. My final takeaway from Microsoft Inspire was the reinforcement that this is a truly global effort to help companies transform through SAM programs. We are thrilled that some partners even took the time to write their own articles showcasing the insight and discussion from the week, including My MSInspire Epiphany – Using SAM for Cyber Defence from SOS, Software Optimisation Services (2016 SAM Partner of the Year) and Software Asset Management as a strategic instrument from AXIANS. As I assured partners in Washington D.C., Microsoft is committed to evolving our SAM and SAM partners more than ever and we look forward to working with you to own tomorrow, together. How have you benefited from the SAM program? 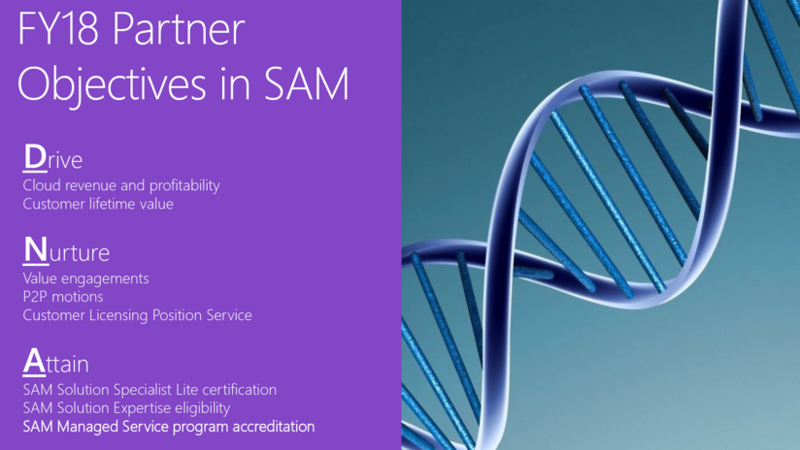 Share your thoughts with the SAM community on the Microsoft Partner Community. Our partners don’t just do more things. They do amazing things.